Ever aware of the shadow of Beethoven, Brahms was 40 years old by the time he completed the first of his three published string quartets (op 51, No.1) in 1873 - he is thought to have destroyed the 20 or so quartets that he had written previously. The third quartet (op.67) followed in 1875, the year before the premiere of the composer’s Symphony No.1, and a decade after the publication of his piano quintet. It's only a little over two months since the death of the Artemis Quartet's viola player, Friedemann Weigle, at the age of just fifty-two. This disc – Weigle's last commercial recording with the group – is dedicated to his memory, and it's a moving and loving tribute, representing this vibrant ensemble at its absolute peak. Brahms's three published string quartets have never really been given their due, either in the context of his own chamber music output, or within the wider string quartet repertoire. His first two published works in the genre, op.51, appeared in 1873, but he had been working on them since at least 1869, and No.1 in C minor may even date back to 1865. Before that, Brahms had tried his hand at the quartet medium (he claimed to have penned twenty such works – perhaps an exaggeration), but his fierce self-criticism saw those early works destroyed. The C minor Quartet which opens this disc, with its relentlessly tight motivic logic and its 'tragic' tonality, has often been criticised as terse, hard-driven, even 'clotted'. 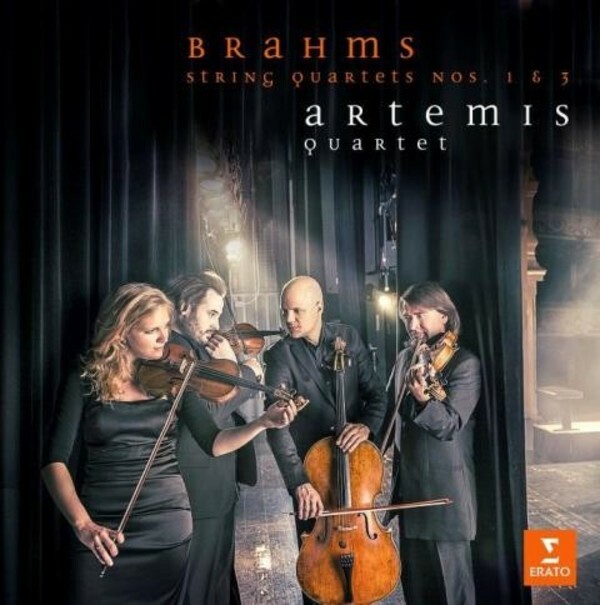 Not so here: the Artemis Quartet bring light and life to this music, with transparent textures that belie Brahms's reputation as a 'heavy' composer. Their tonal and dynamic range is marvellously wide: just try the very opening of the first movement, with its jaw-dropping crescendo culminating in a pair of rhetorical chords whose piano repetition has a gorgeous resonance. The performance is full of such finely-judged details, yet they never impede the music's momentum. This work is often dubbed Beethovenian or Schubertian, and Brahms was certainly aware of the weight of tradition behind him, but here that hinterland is refracted through an up-to-date awareness of historical playing styles, above all of clarity and plasticity. In this performance, the second-movement Romanze has an unmatched delicacy and refinement, while the intermezzo-like Allegretto wears its eery fatalism lightly. Even the passionately intense finale has a buoyancy that keeps the listener not just gripped but fully engaged throughout its course, full-blooded yet flowing. Brahms's third Quartet, in B flat op.67, is known as a lighter counterpart to its two sister works, and is often compared to Mozart's 'Hunt' Quartet, K458, in the same key. Here, even more than in the C minor work, the players are alive to the music's rhythmic and motivic vitality, bringing a welcome vivacity as well as expressive integrity to the performance. The F major Andante is a real delight, deeply felt but never cloying, and the D minor Agitato third movement with its prominent viola part, is a tribute all in itself to Weigle's exceptional playing. The variation-form finale, with its beautifully poised main theme, and another starring role for the viola, is rendered with such charm, grace and command of rubato as to disarm any criticism, a superb ending to a magical disc. So, forget any preconceptions you may have about Brahms's quartets, and just revel in the sheer joy these musicians bring to this extraordinary music. This is artistry of the highest order.